Having a Baby in Costa Rica? So you are thinking of moving to Costa Rica and possibly starting a family? Raising your children in this land of peace and prosperity sounds like a great experience for everybody but maybe you have some questions about what it’s like to give birth in Costa Rica? Many of our clients were asking these same questions so we spoke to a few ex-pat couples who either have had babies recently or are just about to have them in Costa Rica. Out of the whole American Continent (North, Central and South America) only Chile (#44, 7.19) rates better than Costa Rica. Some say that infant mortality is an indicator of a countries health care system and wealth. If you look at the list of countries that rank better than Costa Rica they are all highly developed 1st world countries. The World Health Organization (WHO) rated Costa Rica’s Health Care System at the 37th best in the world just ahead of the United States who ranks 38th. What is even more interesting is that the United States Health Care system is the most expensive in the world whereas Costa Rica’s is just the 50th most expensive in the world. As reported by CNN in 2013 giving birth in the U.S. is more expensive than any other country in the world. Total costs average $18,329 for a vaginal delivery and $27,866 for a C-section, with the bulk of the bill going to insurers. However, families with insurance still have to pay about $3,400 out of pocket. Krista and Chris, one of the ex-pat couples we interviewed for this blog, extensively researched the costs to deliver a baby here in Costa Rica in a private, state-of-the-art maternity hospital facility in either San Jose or Liberia. Total Costs for what they call a luxury natural birth are $3,000. The cost for a C-Section is around $1,500 more. For those of us who are math challenged – The cost to have your baby delivered in Costa Rica with first class doctors and facilities is $3,000 – Still less than the average out of pocket costs of $3,400 for a fully insured birth in the United States. From what Krista and Chris tell us the level of care offered in the private birthing facilities in Costa Rica are a level above the average of what you would receive in The US. You are probably thinking you would hear how Krista was pampered by the ever attentive staff at the CIMA private hospital in San Jose or how the Doctor they had chosen for delivery of their first child is a pioneer in the field of natural child birth or how Chris was able to be in the private room throughout the process and be the birth coach as they had practiced, then load up baby pictures to Facebook using the free WiFi in the private recovery room while Krista and their new child rested and got acquainted in the after birth bliss? So, as Krista Says, the baby “was in a hot hurry” and decided to come 2 weeks early. Well Grandma was not there to help and the trip to the swank birthing palace at the CIMA Hospital in San Jose was off and it became a scramble to not become the first baby to be delivered in a Pacifico Condo. They called Michael Simons and in no time a rental car was delivered personally by Nelson from Adobe rent-a-car, a dog sitter showed up and off they went with Krista in full labor. They arrived at the Liberia Public Hospital, were whisked into the Maternity Ward and literally within 35 minutes Kruz was born. •THEY DID NOT PAY A DIME!!!! 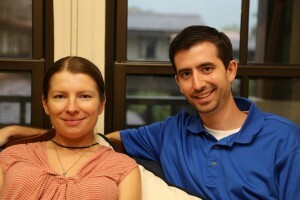 Ania and Drew, the other ex-pat couple we interviewed, are expecting their first baby in the middle of September 2013. During their research they decided right away that they would have their baby at the public hospital in Liberia, Guanacaste, Costa Rica. So far the pre-natal care they have received locally has been wonderful, detailed and free. All they have to do is pay their monthly contribution to the “Caja” which is the Costa Rican version of the Social Security system. The average monthly contribution per family is about $50. We are all anxious to see their new baby so check back for another baby blog for details on their birthing adventure. Generic levitra best price at http://www.noc2healthcare.com/levitra-generic/ guaranteed. Costa Ricans who receive a paycheck from their employer are required to contribute to the caja based on their salary and it is an automatic payment. If one person in your immediate family is contributing to the Caja then your whole family automatically has free health care. So basically everyone in Costa Rica has very inexpensive, relatively good health care that always covers having babies.